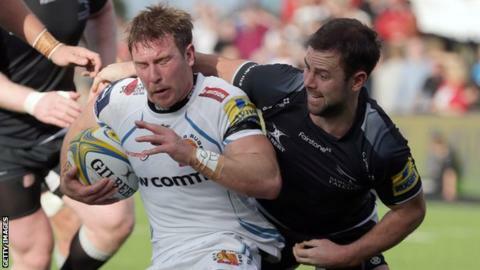 Newcastle Falcons were out-thought by Exeter Chiefs in Sunday's 41-3 home Premiership defeat, says director of rugby Dean Richards. Six tries, including five in a one-sided first half, were enough to extend the Falcons' winless run to three games and leave them without a point. Points difference moved Falcons bottom below London Irish after round three. "We couldn't match them upstairs, their speed of thought was far better than ours," Richards told BBC Newcastle. "We've got nobody to blame but ourselves. We knew how Exeter were going to play, they've got a squad full of promise and play with a huge amount of pace. At times our boys couldn't match that." Newcastle finished 11th last season but comfortably avoided relegation as London Welsh lost all 22 of their matches. Richards has strengthened his squad during the summer in a bid to avoid a similar tussle at the bottom end of the table. "With the squad we've got we should be doing better than we are at the moment," he added. "To leak six tries in the way we did that was really disappointing, we need to look at our defence which was appalling." Next up for the Falcons are Worcester, who have won one of their first three games since returning to the Premiership.